Stimulates telomerase and increased telomere length in vivo. Offers huge promise for extending life expectancy. 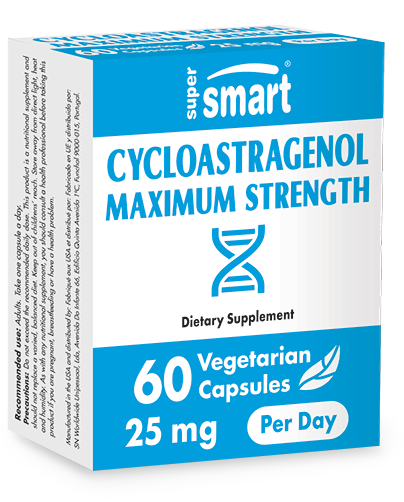 The efficacy of cycloastragenol appears to be dose-dependent and people with the shortest telomeres – often the oldest members of society – achieve better and faster results with higher doses – from between 25mg to even 50mg a day. This new formulation provides the doses required at a 20% lower cost, milligram for milligram. Recent studies have shown that shortened telomeres are responsible for a number of age-related diseases and are also predictive of premature death in elderly subjects. This has been confirmed by examining the immune response of T lymphocytes in terminal-phase infection, the T lymphocytes having significantly shortened telomeres. The study showed a noticeable fall in immune function and increased secretion of various cytokine-related pro-inflammatory factors. In contrast, maintaining a high telomerase level, whether through genetic manipulation or through the introduction of activating substances (such as cycloastragenol), curtails shortening of telomeres and even increases their numbers, restoring a more youthful T lymphocyte profile. ¤ Cycloastragenol can be combined with the anti-aging supplement Astragaloside IV, to provide a wider spectrum of activity, or it can be alternated with it.